Patsy Cline, born Virginia Patterson Hensley, 1932-1963. Legendary country music artist. Vintage glossy 8" x 10" portrait photograph inscribed and signed, Your Friend / Patsy Cline. Accompanied by an original 1957 Patsy Cline Fan Club Bulletin. This is a beautiful early black-and-white portrait of Cline by Rush Studio of Winchester, Virginia, Cline's hometown. It comes from a collection of vintage signed photographs of country music stars originally assembled by the president of recording artist George Morgan's fan club in the mid-1950s. The photograph is accompanied by a two-page 1957 Patsy Cline Fan Club Bulletin. 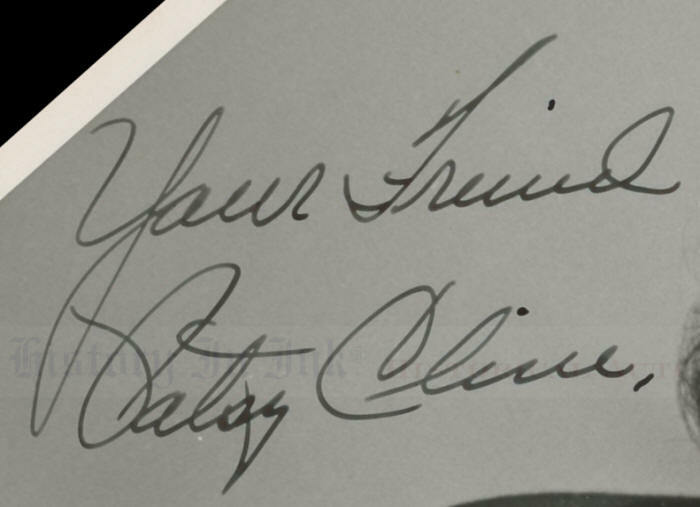 The lead article encourages fans to enter a contest to name Cline's first record album, and the second page contains a notice that the fan club president had "new 8x10 poses of Patsy for sale for only 50� and a 3� stamp. These are autographed." 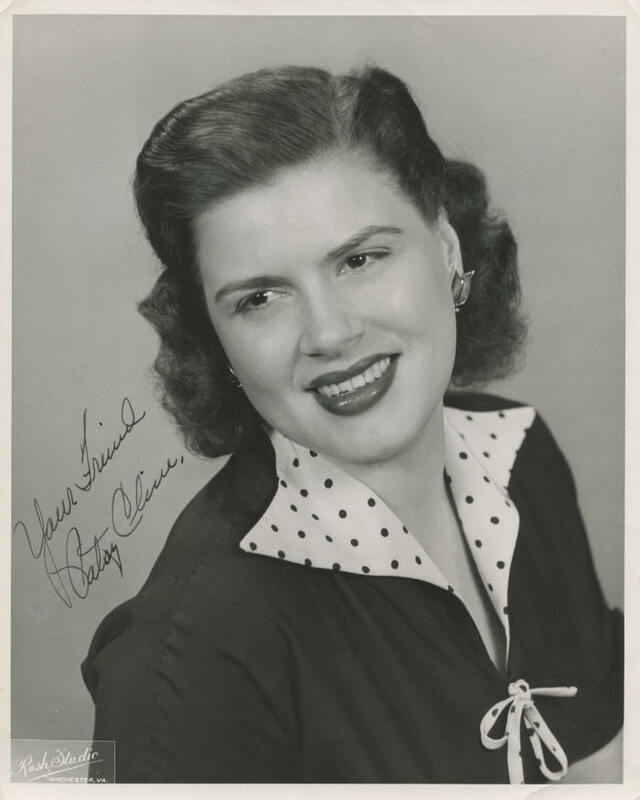 Since the Bulletin lists Cline's address in Winchester, it is highly likely that the original owner, herself a fan club president, ordered the photograph directly from her counterpart at the Patsy Cline Fan Club. An American music legend, Cline has been called one of the most influential, successful, and acclaimed female vocalists of the 20th Century. She was the first female country vocalist to headline her own show. She recorded such country standards as Walkin' After Midnight, a crossover hit that reached # 2 on the Billboard country chart and # 12 on its pop chart, I Fall to Pieces, Sweet Dreams, She's Got You, and what became her signature song, Willie Nelson's renowned Crazy, the most-played jukebox song of all time. She was the first female country artist to perform at New York's Carnegie Hall and the first female solo artist to be inducted into the Country Music Hall of Fame. She also has a star on the Hollywood Walk of Fame. A recent survey ranked her at the top of Country Music Television's 40 Greatest Women in Country. Cline's music career began in earnest when she signed a recording contract with Four Star Records in 1955. On July 1 of that year, she made her network television debut on the television version of Nashville's Grand Ole Opry, and later that month she appeared on ABC's live broadcast of the Ozark Jubilee from Springfield, Missouri, where she became a regular. She gained nationwide fame, though, after singing Walkin' After Midnight on ABC's Arthur Godfrey's Talent Scouts in New York on January 21, 1957. The extremely positive public reaction to the song resulted in its rush release as a single three weeks later. In 1960, she became a member of the Grand Ole Opry cast. Cline was at the top of her career on March 5, 1963, when she and two other country stars, Cowboy Copas and Hawkshaw Hawkins, were killed in a plane crash near Camden, Tennessee, some 90 miles outside of Nashville. They were on their way home from performing three standing-room-only shows as a benefit in Kansas City, Missouri. The pilot was Cline's manager and Copas's son-in-law, Randy Hughes. Hughes, a capable entertainer himself who also played behind Copas and Cline, owned a small, single-engine Piper Comanche airplane that he bought to attract clients and to fly stars from one show to another. He was fearless—in a car he was sometimes known as "The Hundred Mile an Hour Man." Although he was not trained to fly with instruments, Hughes took off despite the advice of the airfield manager in Dyersburg, Tennessee, where he landed to obtain weather information for the rest of the trip, not to fly into the storm that had buffeted Nashville all day. He relied instead on the observations of his wife, Kathy, who was at home in Nashville and had told him by phone that the rain had stopped and that the sun appeared to be setting in the west. Unfortunately, she did not know that she was in the eye of the storm. The plane crashed nose down in a field near Camden, and all four of its passengers died instantaneously. Cline was only 30 years old. We are separately offering an extremely rare vintage signed photograph of Hughes. Click here to see that photo. Cline has boldly inscribed and signed this photograph in black fountain pen. The photo has upper corner bends in the white margin and scattered surface bends that are not particularly apparent unless the light strikes the photo just right. The photograph is in fine to very fine condition. The 6" x 8½" newsletter is stapled at the upper left and has damp staining at the top, left, and bottom edges, but the text is not obscured.  There are minor tears and paper loss along the left edge. Overall the newsletter is in good condition.